Interview: Greg LaRocque, Part III – Retroactive Postgame, a Lost Flash Spinoff and Bettie Page! Longtime Flash artist Greg LaRocque needs little introduction for readers of this site. Hot on the heels of his return to the character in DC Retroactive: The Flash – The ’80s, we caught up with the man once again to talk about the story, his past and future work, as well as the apparent fate of Wally West. This is the third Speed Force interview with Mr. LaRocque. We’ve previously discussed “The Return of Barry Allen” and previewed the Retroactive issue with him. Part three is after the jump! UPDATE: Added some comments from LaRocque, which were originally made in response to the Speed Force review of the issue. Q: Now that the Retroactive issue is out, how did you feel about the finished product? GREG LaROCQUE: It was so cool to visit Wally again. Drawing the imagery to match Bill’s scripts is so enjoyable on so many levels. I’ll be seeing Bill at a show in New Jersey soon & it’s gonna be fun to catch up. I think the book looks great. I thought the approach on the color work fit the publishing look for that era, yet was so well done it looked modern. The pages I’ve seen on line are, of course, brighter than the printed pages. I’m happy & proud of how the book turned out. Q: How does it feel to be the officially definitive Flash artist of that era? A: With Flash #50 on my resume & the redesign to the modern slick look uniform, I’ve been happy with my contributions to Flash history. Just as importantly, Wally has a group of fans who see that as the time they saw Wally grow up. Q: How long did it take you to complete the issue? You were able to ink your own pencils, but some of the creators working on the Retroactive books (Cary Bates is one) have stated they did not have much time to turn in the work. A: Inking my own pencils was the best way to keep the book on schedule. I was happy to get this opportunity to show my skills in that area & to show how I would interpret the Flash costume I designed in #50. 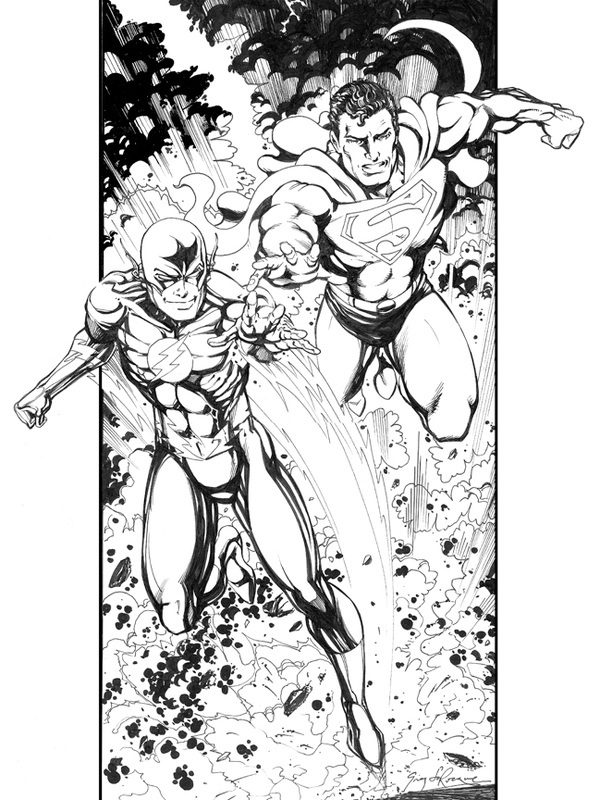 Q: Did you have a “favorite” inker during your time on Flash? 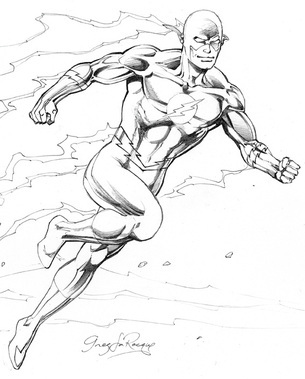 A: I respect the work of all the artists who have worked with me on Flash. I will say this, it does show you how differently the work will look depending on the finisher. & honestly, I tailored my pencils for certain inkers. Q: What did you think of the story they chose to reprint (Flash #18)? Here’s a bit of info from back then. Before Scott Lobdell hit it big at Marvel with his X-Men work, he & I developed a Chunk series for DC that got up to a final signature for approval when DC decided to hold off & it never got done. Q: Was the wink that Alexis gives to the reader scripted exactly as it appeared, or is that one of the embellishments that you mentioned in the previous interview? Q: Did the story arrive to you as a “goodbye” to Wally West, or did you choose to include that emotional angle in your art with moments like the wink, and the dance between Wally and Alexis? A: It was Bill’s script. I did feel it whole heartedly & did my best to translate it visually. There’s always story beneath story for those who look closely. Let me only say Abra Kadabra plays a small yet significant role in this story, yet Bill never wrote a word about him. Bill’s script has the Rogue’s Gallery disappearing into the dark on pg 24, & never mentioned again. The final scene on pg 26 has Alexis looking at Wally through the back window of the police car. I drew everything Bill asked for but by adding some background elements I embellish the scene with a flavor that is not found in the script, & it also provides clues as to why the 90’s sleek costume would be used in the 80’s retro story. By adding the additional threat of Abra Kadabra showing up & Wally ‘suiting up’ to the Flash & we see him in the blink of an eye turn to face that threat, we know his life of fun & adventure continues. That there are more untold tales to tell. We leave Wally/Flash as we remember him. Racing off to adventure. It’s called a retro story, A Wally West Flash in the 1980 s told in a 2011 book. When I got the script I loved what Mr. Loebs had come up with, but I saw my opportunity to have some fun of my own. For those with questions on the continuity in the book, here is my dirty little secret. I created my own pocket universe where the Wally West Flash we all love still endures!! As one of my favorite television series tells us “Only fools are enslaved by time & space”. In Flash # 67 & 68, Flash battles Abra Kadara in a future era. They are returning to Wally’s present at the end of that story. Well, in the retro story you are seeing an untold occurrence from that adventure. Wally veers in his return & ends up here in the 1980 s wearing his 1990 s suit, that is pg 1 of the retro story.. He now inhabits a pocket universe within DC continuity where he continues his adventures, safe from the current DC story line. Thus the differences you’ve noticed. There’s problems with the time stream & the villain behind the scenes is revealed in the last 2 pages if you look closely at the background. The final panel has Wally suiting up to run off to his newest adventure. Happy in the pocket universe. Q: How do you feel about the apparent fate of Wally in the current book? You worked on the character in the years with the heaviest character development; do you feel like that work has been reclassified/marginalized in any way? A: It’s the nature of comics. I found out the Spider-man I drew was a clone. If that history is still standing?? I also drew the death of Superboy, or did I?? The work will always stand on it’s own. Later re-births or re-launches don’t effect that. As they say in my favorite TV show. What happened, happened. Q: I read that you did a signing and some free sketches the day the Retroactive issue was published. How did that go? A: It was fun, Baltimore Comic Con is next [note: was held weekend of Aug. 20 & 21] & a bunch of signings in Philly, VA, & NJ. Q: When you are doing sketches and commissions, what percentage would you say are Flash-related? 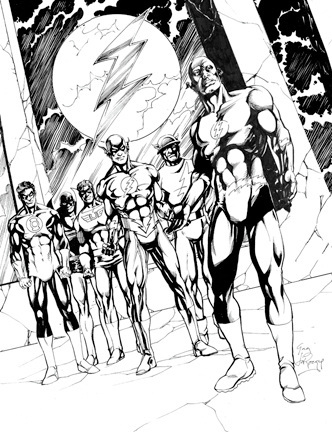 What is the most obscure Flash-related commission that you’ve had requested? 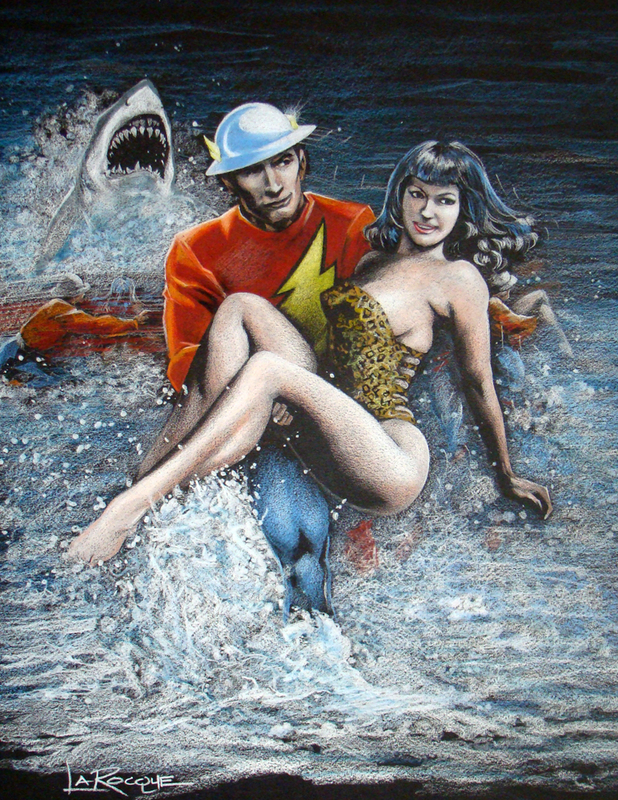 I recently did a Jay Garrick rescuing Bettie Page color commission. Q: Your Exiled Studio has released a TPB of your commission sketches and published a number of comics and GNs. What do you have in the works these days? A: I wish I had time to complete the exiled studio work, but I just can’t fit it in my schedule. Another pin up book is partly done & I would love to continue CryBaby’s story. Right now, I’m set to begin a series for Advent comics titled ‘The Regulators’. I’ll keep you posted. Greg’s site can be found here, and includes many examples of his commission work. This entry was posted in Interviews and tagged DC Retroactive, Greg LaRocque, Interview, William Messner-Loebs on August 22, 2011 by Greg Elias. Great artist. I still love his Wally West. As Flash fans, we really were spoiled with the artists we were given. If the DC Retroactive line has proven anything, so far, it’s that William Messner-Loebs and Greg LaRocque still have it, and should be on a book right now. thanks for the kind words folks, it’s truly appreciated. A ‘Lost’ Flash spin off!! I like it!! Good job Mr. Elias. You drew Return of Barry Allen, Greg (which, essentially, means you drew my childhood) you can have all the kind words from me you will ever want. Except the ones that need to go to William Messner-Loebs and Mark Waid, of course. Great interview!!!! Very fun to learn the secret behind the retro issue. Keep up the great job Greg!!!! Oh, now this is fascinating – a comic I already found a rich experience has an extra level of magic. Thanks for that, Greg, and for all your contributions to my years reading about the LSH and Wally. Please hug Bill Loebs for me and have him hug you back … or go with manly handshakes and back patting.